Anyone who is actually in Melbourne on New Year's Day, this should be a fun show! I'll be playing with a four piece band: Joe Talia (drums), Judith Hamann (cello), Connal Parsley (Bass) and Madeleine Martiniello (Guitar). 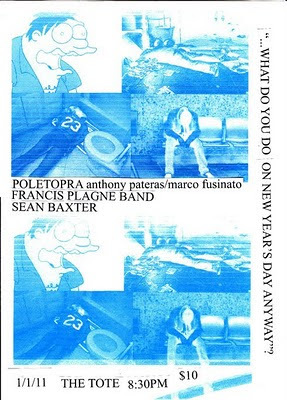 POLETOPRA, FRANCIS PLAGNE and SEAN BAXTER will be sonically curing your injured synapses, with, well, possibly more injury! POLETOPRA is the combination of visual art iconoclast MARCO FUSINATO (guitar/electronics) and all around composer/electronics whacko ANTHONY PATERAS (analogue synth) in searing duo format. Due to busy international schedules, local appearances are rare for this group, so what better way to continue the count down for the Mayans than with the sounds of apocalypse! SEAN BAXTER is THE poet of Melbourne avant sound, and has been an on stage regular at the Tote since the early 90s in guises such as the Throwaways, Bucketrider, Embers and SxSxSx. He even has a photo behind the bar. As head honcho of the Make It Up Club, his speeches are almost as famous as his internationally famous shitcore percussion stylez.